An early scene in Alfred Hitchcock’s To Catch A Thief takes place at Bertani’s restaurant. 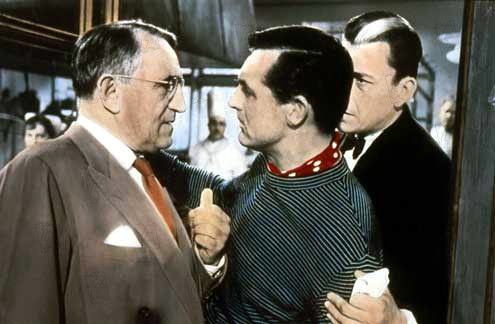 Bertani, played by French actor Charles Vanel, is a former member of the French Resistance who, alongside John Robie (Cary Grant’s character), fought against the Germans in World War 2. Several Le Stuff readers have asked about the location of the restaurant and if there actually was, or is, a real restaurant there. I’ll try to clear up the mystery. 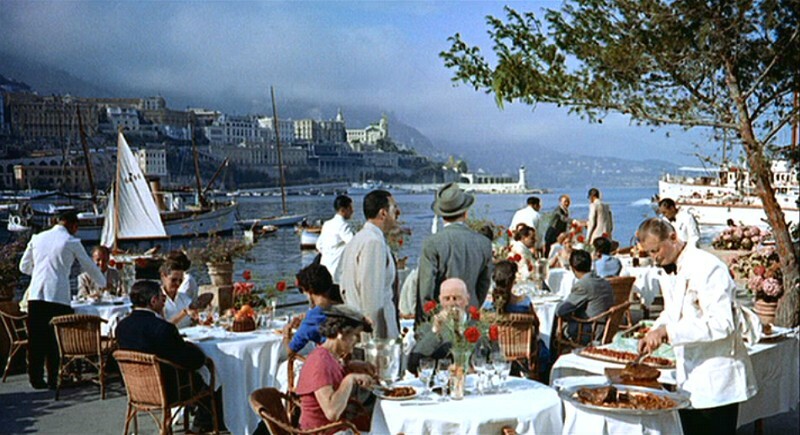 The terrace scene was filmed on the western edge of Port Hercules in Monaco on the Quai Antoine 1er. If there was a working restaurant there it’s now gone. It most certainly would have been destroyed, along with the steps Robie descended to get to it, when substantial improvements were made to the port in the 1970’s (Brigitte Auber was unable to confirm the existence of a former restaurant – her scene in the wine cave was filmed on a set). I’ve tried to find old, pre-seventies photos to see if I could locate the steps, but so far have had no luck. My best guess is that Hitchcock built a “restaurant set” with tables, chairs, etc. on the Quai Antoine 1er. Watch closely and you’ll notice that there is never a continuous shot showing the outside dining area and the front of the restaurant (most likely a set). We only see the dining area and then the film cuts to a shot of the front of the restaurant. This leads me to believe that either there was no restaurant, or if there was, that Hitchcock simply chose not to use it in the film. Thanks! Great article that makes a lot of sense. YouTube and its habit of giving you more videos is your friend. I found your blog recently looking for stuff on the Riviera and TCAT and I was also looking at 1930’s race videos when this video showed up. There is the restaurant in the location that Hitchcock used. Looking at the video in high resolution, the place was name La Racasse, but the place was little more than a large shack and not the elegant place that Hitchcock wanted. So he made sure that the camera neve showed you the building and used a set for the kitchen. Hitchcock preferred sets to locations in any case and he does the same sort of thing in North by Northwest and the Plaza Hotel in NYC.